The idea to adapt a treasured play by William Shakespeare into a film has become as old as the play itself, but Justin Kurzel’s striking new version of the Bard’s most Northern tragedy Macbeth proves that there is still a fresh amount of life in that idea, no matter how ancient it may be. 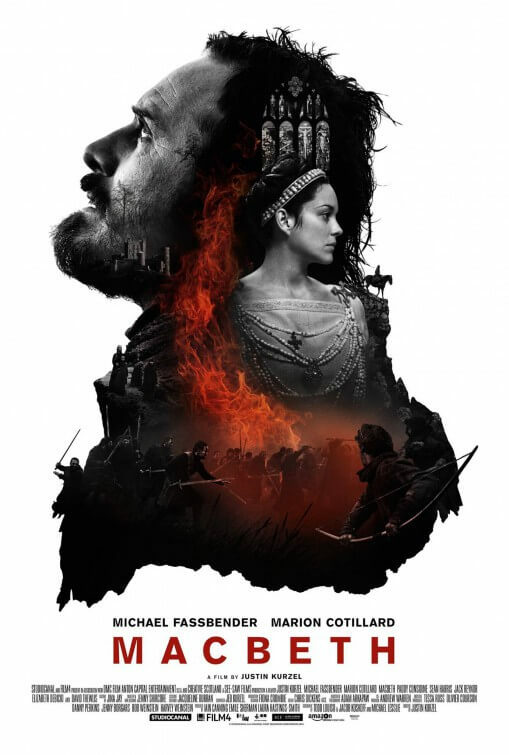 For those who probably never studied it in English classes, Macbeth tells the tale of the titular Scottish noble (played here by the Irish Michael Fassbender) who stumbles upon a trio of witches that tell him a bunch of prophecies, one of which being that he will one day be King. From there, the path to fulfilling the witches’ visions is a long and murderous one, aided by his conniving wife and the original femme fatale Lady Macbeth (Marion Cotillard), and as is common with Shakespeare’s anti-heroes his unravelling eventually leads to his downfall. Kurzel – on his second feature film after the critically-adored Australian drama Snowtown – maintains the basic story for his version, as well as a good chunk of the original dialogue, but it becomes extraordinarily clear early on that he wants this classic story to be told as visually as possible, relying less on the words and more on what’s on screen in front of us. This is a prime example of a Shakespeare adaptation that fully embraces the visual medium of film, as opposed to staging everything as if it were the play it was meant to be – for instance, events only hinted at in the source material through words, such as a major battle that Macbeth leads and wins and, more crucially, the early death of Macbeth and Lady Macbeth’s child, are shown in full detail early on, often without the necessity of dialogue. If it were any other adaptation, chances are it would all remain strictly as exposition, but Kurzel is smart enough to actually use the language of film to his advantage and show it instead of tell it. We struggle to think of many other adaptations of Shakespeare, let alone ones of Macbeth, that have actually achieved what Kurzel achieves here, and as such it really strikes as being completely unique and unwilling to succumb to tradition. Because Kurzel is eager to use as much of the film’s visuals as he can to tell the story, it’s fitting that he hires cinematographer Adam Arkapaw – best known for providing the imagery from the first series of True Detective – to craft some of the most captivating visuals you’ll likely see all year. Some, such as a few 300-style slo-mo shots of battle, are a masterclass of allowing the audience to absorb every detail, while others like a climactic battle amidst a red-tinted backdrop manage to both terrify and mesmerise at the same time. Throughout the entire film, whether it’s the fog-lit highlands or the stunningly medieval interior of a castle, everything looks absolutely breath-taking and effortlessly beautiful, no matter how dark the context, and we imagine it will be very hard for any other film this year to top this film’s stunning visual prowess. As with any adaptation of The Scottish Play, as it’s known amongst superstitious stagehands, it lives or dies depending on its two lead actors, and Kurzel thankfully remembers amidst the fantastic visual direction to deliver two equally strong performances from both Fassbender and Cotillard. The latter’s character is considered by many to be one of Shakespeare’s most complex female characters, and though elements of her crafty nature are certainly on display here, it may come as a shock to some that Lady Macbeth is mostly side-lined here and portrayed as more of a goading accomplice than the cunning mastermind she was intended to be, but Cotillard is still great here and makes the most of her screen-time as much as possible. The real focus is indeed on Fassbender’s Macbeth, portraying him as a man bound to commit the most heinous of acts as a result of guilt and trauma received from the battle field – a young man who met his fate in front of Macbeth pops up frequently as a ghost to haunt him, even handing him the dagger to commit the initial murder – and Fassbender is nothing short of spectacular as a man driven by pure tyranny, but also regret and self-doubt. With an extremely firm grasp on everything that should make the work of Shakespeare a true delight on the big screen, Kurzel has not only crafted a version of Macbeth that will truly stand the rest of time, but also achieves the impossible in making us extremely excited for a forthcoming video game adaptation (he’s currently shooting Assassin’s Creed, once more with Fassbender and Cotillard starring – and yes, Arkapaw is indeed the cinematographer on that one, too…). For those reasons, and more, it definitely deserves to be seen by even the most superstitious of the Bard’s following. Macbeth is a stunning and captivating adaptation of the classic Shakespeare play, which soars thanks to Justin Kurzel’s unique visual storytelling (along with cinematographer Adam Arkapaw’s fantastic imagery) and two solid lead performances by Michael Fassbender and Marion Cotillard as the Bard’s most murderous duo.